HORROR UPON HORROR in the HOUSE OF DRACULA! One of the last entries in the series of films launched by 1931’s classic Dracula, 1945’s House of Dracula comes with a slightly misleading title. Despite the focus on our favorite vampire, House features a mess of other monsters as well. Essentially a sequel to 1944’s House of Frankenstein, House of Dracula picks up introduces us to Dr. Franz Edelmann (Onslow Stevens), a specialist who may be able to cure various creatures of their “maladies”. “Baron Latos” – really Count Dracula (John Carradine) - goes to Dr. Edelmann in alleged pursuit of a way out of his vampiric status, but in truth, he simply uses this as a ruse so he can get closer to the doctor’s assistant Milizia Morelle (Martha O’Driscoll) and transform her. In addition, Larry Talbot (Lon Chaney Jr.) – aka the Wolf Man – also comes to visit Dr. Edelmann for treatment. Both threads lead to a series of concerns. Though House of Dracula acts as a follow-up to House of Frankenstein, the two films seem quite different. House of Frankenstein offers a silly but fun romp, whereas House of Dracula tends to take itself a lot more seriously. That becomes a strength and a weakness. On one hand, I admire the movie’s attempts at drama and psychological depth, as it digs into the burdens that come with monster status. Dracula boasts a narrative more ambitious than one would expect from a quick, cheap horror sequel. Unfortunately, it doesn’t manage to live up to its aspirations. Despite the movie’s interesting plot/character notions, it remains shallow and without much emotion. Even at a brief 67 minutes, it tends to plod and move at a snail’s pace. It’s definitely nowhere near as entertaining as the goofy House of Frankenstein. As absurd as the earlier film was, at least it kept us involved. House of Dracula lacks much excitement, as it just meanders from one dull conversation to another. Oh, we still find the occasional “action” scene, but these fall flat. Even the climactic attempt at mayhem seems perfunctory, and the movie’s abrupt ending becomes bizarre and unsatisfying. At least the actors do fairly well. I was never wild about Chaney’s Wolf Man, but he brings a bit more gravity to the role here, and Carradine does much better as Dracula in this flick than he did in House of Frankenstein. Tall and gaunt, he feels wrong in a physical sense – he looks more like he should play the Mummy – but Carradine offers reasonable menace and eerie qualities to Dracula. All of this leaves House of Dracula as a middle of the road horror effort. It works better than it probably should, but it still seems too dull to be more than an admirable misfire. 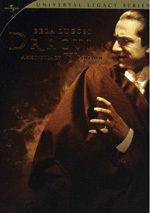 House of Dracula appears in an aspect ratio of approximately 1.33:1; due to those dimensions, the image has NOT been enhanced for 16X9 televisions. This was a decent transfer but nothing great. Overall sharpness seemed pretty good. Some softness crept in at times – exacerbated by mild edge haloes – but in general, I thought definition seemed acceptable. Wide shots looked worst, but we didn’t get enough of those to make a tremendous negative impact. The movie showed only mild shimmering and jaggies. In terms of print flaws, I saw occasional specks and blotches, and the image tended to wobble somewhat. Blacks were fairly dense, and shadows showed reasonable clarity. Nothing here excelled, but the image was acceptable for is age. I felt the same about the movie’s Dolby Digital Monaural soundtrack, as it seemed perfectly passable for a 70-year-old mix. Speech could be a little reedy and edgy, but the lines remained intelligible. Music showed tinny/slightly shrill qualities as well, but the score was reasonably robust given its age. Effects appeared thin but failed to suffer from distortion or other concerns. Background noise wasn’t a concern. This turned into an average soundtrack for a movie from 1945. Though House includes no supplements, I didn’t think it was fair to give it an “F” for its lack of extras. As part of the “Dracula Legacy Collection”, it’s really a bonus feature itself. Supplements would’ve been nice but weren’t expected. Even with a surprisingly ambitious narrative, House of Dracula doesn’t go much of anywhere. It lacks the depth it needs and fails to produce much entertainment value. 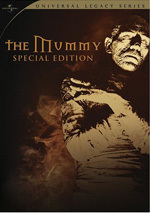 The DVD offers acceptable picture and audio. I don’t think this is a bad movie, but it’s fairly mediocre despite its potentially involving plot. 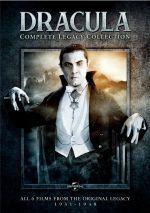 Note that House of Dracula appears solely as part of the “Dracula Legacy Collection”. This set also includes Dracula, Dracula’s Daughter, Son of Dracula, House of Frankenstein and Abbott and Costello Meet Frankenstein.